Through the Lens Thursday 46. Shine. This week’s Through the Lens Thursday prompt is ‘Shine’, so as soon as the sun started to shine through our stained glass windows I grabbed the camera and snapped away. As I was looking at the pictures, I got the feeling I had done this before. So I looked back at previous TTLT weeks and there it was, week 8 ‘Window‘. Time to re-think this week’s picture then. Sunshine I thought, that will be a good ‘Shine’ subject, look up at cloudy skies….. The shower was dripping, so I went to make sure it was properly turned off and there it was, all shiny! So I gave it a quick wipe over and made sure it wasn’t still dripping. I got into the shower, assumed a strange lunge position directly under it, said a little prayer to the plumbing gods that it not drip onto my camera and snapped this picture. 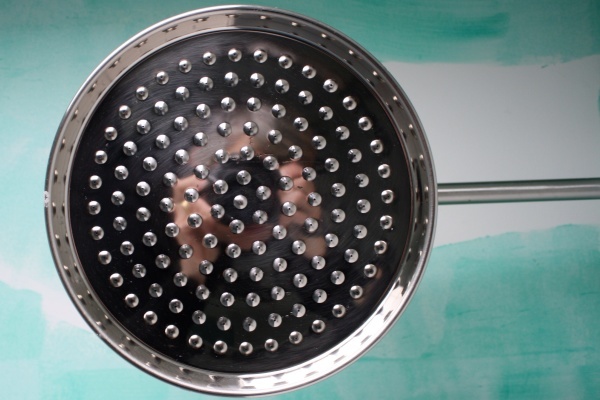 I like that I am reflected in the shower head and I like that you can’t see the pained look on my face as I try to hold still! I love this, so clever!! Previous PostWhat I am wearing in the cold today.